Excellent product and great service, fair peicing and good delivery. JD. The old battery was well past it's sell-by date. With the new battery I can now fire up the scooter on the starter button as opposed to having to use the kickstart. Actually got a real person on the phone to help me make a selection. Fast and efficient. 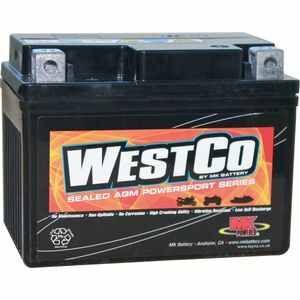 This battery is amazing, I am using it on a total loss ignition for my roadrace bike, (which means its not charged by an alternator/generator), I bought a second as a back up but didn't need it. I won 3 out of 4 races and 2nd place in the other. The Tayna staff sent immediate replies to my queries. So big thank you Tayna & Westco.